This article is about the television series. For the other media in the franchise, see My Little Pony (2010 toyline). My Little Pony: Friendship Is Magic is a Canadian-American children's animated fantasy television series created by Lauren Faust for Hasbro. The series is based on Hasbro's My Little Pony line of toys and animated works and is often referred to by collectors as the fourth generation ("G4") of the franchise. The series premiered on October 10, 2010, on The Hub cable channel (which was renamed as Discovery Family in late 2014). 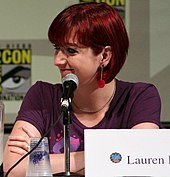 Hasbro selected animator Lauren Faust as the creative director and executive producer for the show. Faust sought to challenge the established nature of the existing My Little Pony line, creating more in-depth characters and adventurous settings; she left the series during season 2, to be replaced by Meghan McCarthy as showrunner. The show follows a studious anthropomorphic unicorn pony named Twilight Sparkle as her mentor Princess Celestia guides her to learn about friendship in the town of Ponyville. Twilight and her dragon assistant Spike become close friends with five other ponies: Applejack, Rarity, Fluttershy, Rainbow Dash, and Pinkie Pie. Each of the ponies represent a different facet of friendship, and Twilight discovers herself to be a key part of the magical artifacts known as the "Elements of Harmony". The ponies travel on adventures and help others around Equestria while working out problems that arise in their own friendships. The series has become a major commercial success, becoming the most highly rated original production in the Hub Network's broadcast history and leading to new merchandising opportunities for Hasbro, including books, clothing, collectible trading cards, and comics. Despite the target demographic of young girls, Friendship Is Magic has also gained a large following of older viewers, mainly young and middle-aged men, who call themselves "bronies". Portions of the show have become part of the remix culture, and have formed the basis for a variety of internet memes. As of April 2019, the show is currently on its ninth and final season. A feature-length film adaptation directly based on the TV series, titled My Little Pony: The Movie, was theatrically released on October 6, 2017 in the United States. A spin-off franchise, My Little Pony: Equestria Girls, was launched in 2013. The first two films, Equestria Girls and Rainbow Rocks, were shown in limited theatrical screenings prior to television broadcast and home media release. Hasbro, Inc. has produced several incarnations and lines of toys and entertainment related to the My Little Pony franchise, often labeled by collectors as "generations". The animated series My Little Pony Tales which premiered in 1992 was the toy line's most recent television series before Friendship Is Magic, featuring the pony designs of the first toy line. It was followed by various direct-to-video releases, which featured later designs up to the third incarnation of the franchise. Just as Michael Bay's film had helped to boost the new Transformers toy line, Hasbro wanted to retool the My Little Pony franchise and update it to better suit the current demographic and taste of young girls. According to Margaret Loesch, CEO of Hub Network, revisiting properties that had worked in the past was an important programming decision, influenced to an extent by the opinions of the network's programming executives, a number of whom were once fans of such shows. Senior Vice President Linda Steiner also stated that they "intended to have the show appeal to a larger demographic", with the concept of "co-viewing" of parents with their children being a central theme of the Hub Network's programming. Central themes that Hasbro sought for the show included friendships and working together, factors they determined from market research in how girls played with their toys. Lauren Faust, developer and initial showrunner of My Little Pony: Friendship Is Magic. Animator and writer Lauren Faust approached Hasbro, seeking to develop her girls' toys property "Galaxy Girls" into an animated series. Faust, who had previously worked on Cartoon Network's The Powerpuff Girls and Foster's Home for Imaginary Friends, had been pitching original animation aimed at girls for years, but had always been rejected by studios and networks because cartoons for girls were considered unsuccessful. When she pitched to Lisa Licht of Hasbro Studios, Licht showed Faust one of their recent My Little Pony animated works, Princess Promenade, "completely on the fly". Licht considered that Faust's style was well suited to that line, and asked her to consider "some ideas where to take a new version of the franchise". Faust was initially hired by Hasbro to create a pitch bible for the show, allowing her to get additional help with conceptualization. Faust said she was "extremely skeptical" about taking the job at first because she had always found shows based on girls' toys to be boring and unrelatable. My Little Pony was one of her favorite childhood toys, but she was disappointed that her imagination at the time was nothing like the animated shows, in which the characters, according to Faust, "just had endless tea parties, giggled over nothing and defeated villains by either sharing with them or crying". With the chance to work on My Little Pony, she hoped to prove that "cartoons for girls don't have to be a puddle of smooshy, cutesy-wootsy, goody-two-shoeness". To do this, she incorporated into the design of the characters and the show many elements that contradicted idealized stereotypes of girls, such as diverse personalities, the message that friends can be different and can get into arguments but still be friends, and the idea that girls should not be limited by what others say they can or cannot do. Elements of the characters' personalities and the show's settings were based on her own childhood imagination of the ponies' adventures, in part inspired by the animated shows that her brothers would watch while growing up, such as Transformers and G.I. Joe; she considered that she was making Friendship Is Magic "for me as an eight-year-old". Faust still aimed for the characters to be "relatable" characters, using stereotypical "icons of girliness" (such as the waif or the bookworm) in order to broaden the appeal of the characters for the young female audience. Faust stated that as she provided Hasbro with more of her ideas for the show, she was inspired by their positive response to the non-traditional elements. Faust had initially pitched the show to include "adventure stories" in a similar proportion to "relationship stories", but recognizing the younger target audience, as well as the difficulty of basing complex plots on the adventure elements, she trimmed back this content, focusing more on exchanges between the characters. The show still incorporates episodic creatures intended to be frightening to children, such as dragons and hydras, but it places more emphasis on the friendships among the characters, displayed with a comedic tone. By the time the show was approved, Faust had developed three full scripts for the series. Faust began to work out concept sketches, several of which appeared on her DeviantArt page, including ponies from the original series (Twilight, Applejack, Firefly, Surprise, Posey and Sparkler), which later provided the core for the main cast of the show. Hasbro approved the show with Faust as Executive Producer and asked her to complete the pitch bible. In order to do so, Faust brought in Martin Ansolabehere and Paul Rudish, who had worked on other animated shows with her. 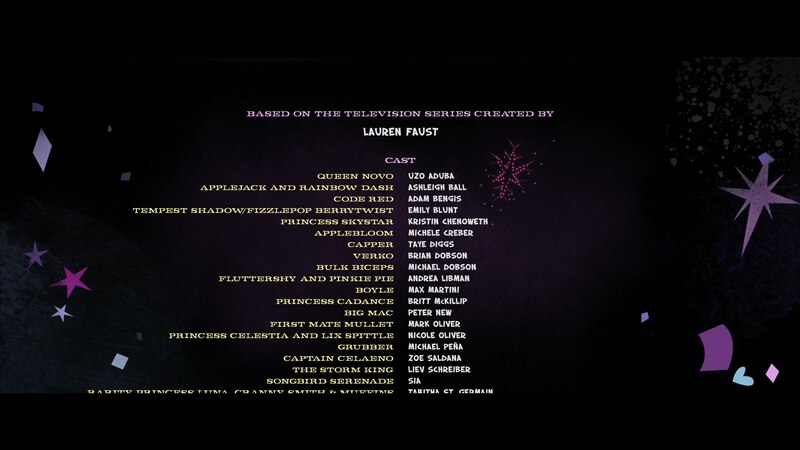 Faust credits Rudish for the inspiration of the pegasus ponies controlling the weather in Equestria, as well as the character of Nightmare Moon during this period. Faust also consulted Craig McCracken, her husband and also an animator and creator of The Powerpuff Girls and Foster's Home for Imaginary Friends. After seeing the initial version of the pitch bible, Hasbro requested more character designs from Faust's team; subsequently, Faust brought aboard Dave Dunnet and Lynne Naylor to further refine the background and character styles. On completion of the pitch bible, Hasbro and Faust began looking at studios for the animation. Studio B Productions (renamed to DHX Media on September 8, 2010, after its parent company, along with DHX's other subsidiaries) had previously worked on Macromedia Flash-based animations and on shows that featured a large number of animals, and Faust felt they would be a good selection. Studio B requested that Jayson Thiessen be the director, a choice Faust agreed with. She, Thiessen, and James Wootton led the completion of a two-minute short to pitch the final product to Hasbro, resulting in the company's sanctioning the full production. Faust estimates that from being initially asked to develop the show until this point took roughly one year. The show is developed at Hasbro Studios in Los Angeles, where most of the writing staff is located, and at DHX Media Vancouver in Vancouver, British Columbia, for the animation work. Faust's initial writing staff at Hasbro Studios included several writers who had worked with her on her previous shows and were approved by Hasbro. These included Amy Keating Rogers, Cindy Morrow, Meghan McCarthy, Chris Savino, Charlotte Fullerton, M.A. Larson, and Dave Polsky. The writing process began with Faust and Renzetti coming up with broad plots for each show. The two would then hold a brainstorming session with each episode's writer, allowing the writer to script out scenes and dialogue. Faust and Renzetti then worked with the writer to finalize the scripts and assign some basic storyboard instructions. Hasbro was involved throughout this process and laid down some of the concepts to be incorporated into the show. Examples of Hasbro's influence include having Celestia be a princess rather than a queen, making one of the ponies focused on fashion, and portraying toy sets in relevant places within the story, such as Rarity's boutique. In some cases, Hasbro requested that the show include a setting, but allowed Faust and her team to create its visual style, and Hasbro then based the toy set on it; an example is the Ponyville schoolhouse. Faust also had to write to the E/I ("educational and informational") standards that Hasbro required of the show, making the crafting of some of the situations she would have normally done on other animated shows more difficult; for example, Faust cited having one character call another an "egghead" as "treading a very delicate line", and having one character cheat in a competition as "worrisome to some". Each episode also generally includes a moral or life lesson, but these were chosen to "cross a broad spectrum of personal experiences", and not just to suit children. Because intellectual property issues had caused Hasbro to lose some of the rights on the original pony names, the show includes a mix of original characters from the toy line and new characters developed for the show. Completed scripts were sent to Studio B for pre-production and animation using Macromedia Flash Professional 8. Thiessen's production team was also allowed to select key personnel subject to Hasbro's approval; one of those selected was art director Ridd Sorensen. The Studio B team would storyboard the provided scripts, incorporating any direction and sometimes managing to create scenes that the writers had believed impossible to show in animation. The animators would then prepare the key character poses, layout, background art, and other main elements, and send these versions back to the production team in Los Angeles for review by Hasbro and suggestions from the writers. Thiessen credited much of the technical expertise in the show to Wooton, who created Flash programs to optimize the placement and posing of the pony characters and other elements, simplifying and economizing on the amount of work needed from the other animators. For example, the ponies' manes and tails are generally fixed shapes, animated by bending and stretching them in curves in three dimensions and giving them a sense of movement without the high cost of individual animated hairs. The storyboard artists and animators also need to fill in background characters for otherwise scripted scenes as to populate the world. According to writer Meghan McCarthy, many of the small nods to the fandom, pop culture references, or other easter eggs would be added at this point by the studio. Once the pre-production work was approved and completed, the episode would then be animated. Though Studio B performed the initial animation work, the final steps were passed to Top Draw Animation in the Philippines, an animation studio that Studio B had worked with in the later part of season one and beyond. The voice casting and production is handled by Voicebox Productions, with Terry Klassen as the series' voice director. Faust, Thiessen, and others participated in selecting voice actors, and Hasbro gave final approval. The voice work is performed prior to the animation, with the animators in the room to help provide direction; according to Libman, this allows herself and the other actors to play the character without certain limitations. Libman noted that for recording her lines as the hyperactive Pinkie Pie, "I learned that I can go as over the top as I want and they [the animators] rarely pull me back." The series' background music is composed by William Kevin Anderson, and Daniel Ingram composes the songs, which are only included if they would make sense in the episode's script. The production team identifies specific parts of the episode where they want music cues, allowing Anderson to create appropriate music for each. Ingram works alongside Anderson's compositions to create vocal songs that mesh with the background music while filling out the show's fantasy setting. The composition of the music and songs far precedes the broadcast of the episode; for example, songs for the show's third season that began airing in November 2012 were composed in 2011. Ingram considered that songs from previous shows of My Little Pony were "a little bit dated" and decided to bring more interesting work to the Friendship Is Magic series. Such changes include making songs with more emotional depth than typical for children's animation, and tending to write songs that can be enjoyed musically outside of the context of the episode. Ingram's songs have "became bigger and more epic, more Broadway and more cinematic over time" with Hasbro blessing the effort to try "something groundbreaking for daytime television", according to Ingram. Lyrics and overall musical themes may be suggested by the writers; two examples include songs written by Amy Keating Rogers, who is a self-professed Stephen Sondheim fan. The song "The Art of the Dress" in the first-season episode "Suited for Success" is inspired by "Putting it Together" from the musical Sunday in the Park with George, while the season one finale's song, "At The Gala", is based on Sondheim's Into the Woods. A large musical number in the episode "The Super Speedy Cider Squeezy 6000" paid homage to the song "Ya Got Trouble" from Meredith Willson's musical, The Music Man. Before the show was approved, Hasbro and Faust had planned for episodes to be 11 minutes long, to which Faust conformed in her first full-length script, "The Ticket Master", which was part of the pitch bible. However, Faust preferred more traditional 22-minute episodes, and Hasbro eventually agreed to this. The initial production stages were very tight, requiring a schedule twice as fast as Faust had previously experienced, and frequent remote communication between the Los Angeles writing offices and the animation studio in Vancouver. 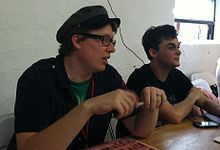 At times, the two teams would hold "writer's summits" to propose new ideas for characters and situations, at which the animation team would provide suggestions on visuals, body language, and characterization. Faust estimates that the time to complete one episode was one year; at one point, the team was simultaneously working on various stages of all 26 episodes of the first season, and when the second season was approved, that number rose temporarily to 32. Episodes then aired about a month after completion. Thiessen explained that they had pushed to start work on the second season as soon as the first was completed, to prevent staff turnover. After the airing of the first season's finale, Faust announced that she had left the show, and would be credited in the future as Consulting Producer. Her involvement in the second season consists mainly of story conception and scripts, and the involvement ceased after the second season. Despite leaving, she still has high hopes for the staff members, stating that "the gaps I have left are being filled by the same amazing artists, writers, and directors who brought you Season 1. I'm certain the show will be as entertaining as ever". In an interview with New York Magazine, Faust stated her reasons for leaving were a combination of a hectic production schedules and a lack of creative control she had with the series. According to her husband McCracken, Faust's departure was due to the fact that as a toy company-driven show, "there were things she wanted to do with that series that she just wasn't able to do", and that there is "still some frustration with" not being able to bring some of her ideas to screen. Friendship Is Magic takes place in the land of Equestria, populated by varieties of ponies including variants of Pegasus and unicorn, along with other sentient and non-sentient creatures. The central character is Twilight Sparkle, a unicorn mare sent by her mentor Princess Celestia, ruler of Equestria, to the town of Ponyville to study the magic of friendship. In the show's opening episode "Friendship Is Magic", Twilight resents this assignment, as she is more concerned about the foretold appearance of Nightmare Moon, the evil sister of Celestia. When Nightmare Moon does appear, vowing everlasting night and causing Celestia to disappear, Twilight sets off with five other ponies – Applejack, Fluttershy, Pinkie Pie, Rainbow Dash, and Rarity – to obtain the Elements of Harmony and defeat Nightmare Moon. Before Twilight can activate the Elements, Nightmare Moon appears and shatters them. In a flash of inspiration, Twilight realizes that each of her new friends represents one of the Elements of Harmony (Honesty, Loyalty, Laughter, Generosity, and Kindness), and that she herself is the final piece, Magic. The magical power of the ponies' friendship reverts Nightmare Moon to a repentant Princess Luna. Celestia reappears, reunites with her sister Princess Luna, and decrees that Twilight shall stay in Ponyville to continue studying the magic of friendship, much to the happiness of Twilight and her new friends. Later episodes follow Twilight and her friends dealing with various problems around Ponyville, including interpersonal problems between friends and family, as well as more adventurous stories involving creatures like dragons and hydras, and having to save Equestria from villainous characters. At the end of each episode, Twilight sends a report back to Celestia explaining what she learned about friendship from these adventures. This part of the formula is abandoned in "Lesson Zero", the second-season episode in which Twilight is convinced to be less rigid in her perceived duties; after this, all the principals contribute reports, although the formality is disregarded when appropriate. In the fourth season, with the request for reports no longer applicable, the six resolve to keep a collective personal journal in which they record their thoughts about life for posterity. Another focus of the show is the Cutie Mark Crusaders, a trio of much younger mares consisting of Apple Bloom, Sweetie Belle, and Scootaloo, who are obsessed with finding their "cutie marks", an iconic symbol that magically appear on a pony's flank once they have discovered their special talent in life. The show regularly features episodes centered on the Crusaders, who have yet to receive their cutie marks and are teased by other young ponies as "blank flanks". In response, they desperately hurry to try to discover their talents and receive their own cutie marks, often doing so in comical fashions. Although the episodes are designed to stand alone, the series features continuity and overall story arcs, with several key elements of the series changing; one such change is the evolution of Twilight herself, who spends the first three seasons learning about friendship and is subsequently granted wings by Celestia to become an alicorn and a princess in the season 3 finale "Magical Mystery Cure". In the season 4 finale "Twilight's Kingdom", she discovers that she is the Princess of Friendship and starts living in a magic castle after the destruction of her library home from previous seasons. Other crucial events impacting the series are the Cutie Mark Crusaders finally obtaining their cutie marks in the season 5 episode "Crusaders of the Lost Mark"; the same season's introduction of Starlight Glimmer, a villainous character who redeems herself and becomes Twilight's pupil in the season finale "The Cutie Re-Mark"; and Rainbow Dash fulfilling her lifelong dream of joining the elite Wonderbolts flight team in the season 6 episode "Newbie Dash". Each season typically has a theme and overall story arc: a theme throughout the first season, for example, is ponies' preparation for the Grand Galloping Gala that occurs in the final episode of that season. In season 4, the Mane Six must find six keys to a mysterious box revealed after they relinquish the Elements of Harmony to their original source, the Tree of Harmony, to save Equestria; in the season finale, it is revealed that they had already obtained the keys, in the form of gifts they received during the season from people they helped. The cast of Friendship Is Magic, presented as a poster at the 2011 San Diego Comic-Con. Major characters include (mid-front row, starting sixth from left) Rainbow Dash, Pinkie Pie, Applejack, Twilight Sparkle, Fluttershy, Spike and Rarity. The poster also includes minor characters and those named by the fandom, including Derpy, DJ Pon-3, and Doctor Hooves. Applejack (Ball), a hard-working pony who works on her family's apple farm. Other main characters are the Cutie Mark Crusaders, consisting of Applejack's younger sister Apple Bloom (Michelle Creber), Rarity's younger sister Sweetie Belle (Claire Corlett), and Scootaloo (Madeleine Peters). The two alicorns ruling over Equestria, Twilight's mentor Princess Celestia (Nicole Oliver), and the younger Princess Luna (St. Germain), also appear regularly; another alicorn, Princess Cadance (Britt McKillip), is introduced in the season two finale "A Canterlot Wedding" and oversees the northern Crystal Empire alongside her husband Shining Armor (Andrew Francis), a unicorn who is also Twilight's older brother. The season five premiere "The Cutie Map" introduces Starlight Glimmer (Kelly Sheridan), an antagonist who subsequently becomes Twilight's pupil in the season finale, "The Cutie Re-Mark". Many friends, family members, and other residents of Ponyville appear frequently, including Applejack's older brother Big McIntosh (Peter New) and grandmother Granny Smith (St. Germain); the Crusaders' teacher Cheerilee (Oliver) and nemeses Diamond Tiara (Chantal Strand) and Silver Spoon (Shannon Chan-Kent); the town's mayor, Mayor Mare (Weseluck); and the muscular pegasus Bulk Biceps (Michael Dobson). Notable secondary characters outside of Ponyville include the self-proclaimed "great and powerful" traveling magician Trixie (Kathleen Barr); the eccentric zebra Zecora (Brenda Crichlow), who lives in the nearby Everfree Forest and dabbles in herbal medicine; the Wonderbolts Spitfire (Kelly Metzger) and Soarin (Matt Hill); and Pinkie Pie's older sister Maud (Ingrid Nilson), who rarely expresses emotion and is obsessed with rocks. The Mane Six also face several antagonists; one of them, the chimera-like trickster Discord (John de Lancie), is introduced in season 2 and subsequently becomes a recurring character of the show. The show also features an extensive cast of over 200 minor background characters. Several of these background ponies became fan favorites, leading to them having their roles expanded; the show's one-hundredth episode "Slice of Life" focuses almost entirely on some the most popular of them. In total, 200 episodes have been produced and broadcast. My Little Pony: Friendship Is Magic is one of several animated shows used to premiere The Hub, a retooling of the Discovery Kids channel of Discovery Communications in United States markets. The block of programming is a joint development of Hasbro and Discovery, designed to compete with similar family-friendly programming blocks on other networks such as the Disney Channel and Nickelodeon. The first episode of Friendship Is Magic premiered on the first Hub broadcast, on October 10, 2010. In March 2011, the show was renewed for a second season to air in 2011–12. The season two premiere on September 17, 2011, had 339,000 viewers, and Hasbro reported that the second-season finale, "A Canterlot Wedding", produced the best ratings of the history of the network in its core and other demographics, with an estimated 1,032,400 viewers. The series is rated TV-Y and targeted at girls 4–7 years old. The first season was produced and broadcast to "E/I" ("educational and informational") standards, but Hasbro allowed the standard to be dropped in the second season. My Little Pony: Friendship Is Magic has been distributed to international markets, including Treehouse TV for the English-speaking audience in Canada, Boomerang in the United Kingdom until 2012 and on Tiny Pop and Pop (UK and Ireland), two British free-to-air children's television channels owned and operated by CSC Media Group, from September 2013, Okto in Singapore, Cartoon Network and later Boomerang with Eleven airing repeats in Australia and TV2 in New Zealand, ntv7 in Malaysia, e-Junior in the United Arab Emirates, Tooniverse in South Korea, and TV Tokyo (seasons 1–2) in Japan. Some of these international broadcasts, including language translations, were arranged with Turner Broadcasting System, which had broadcast Friendship Is Magic and other Hasbro shows on many of their European and Middle Eastern channels. The Japanese broadcast of the show has two audio tracks: the original English-language audio track (available via SAP) and a Japanese-language audio track. According to Hasbro Studio's CEO Stephen Davis, they have marketed the show to over 180 territories around the world. In the United States, episodes of Friendship Is Magic are available for digital download through the iTunes Store. Along with several other Hasbro properties, the show's episodes were added to the Netflix video streaming service on April 1, 2012. A two-episode DVD, "Celebration at Canterlot", was offered to Target Corporation stores as an exclusive, packaged with certain toys from the franchise. Shout! Factory has the DVD publishing rights for the series within Region 1. Fifteen five-episode DVDs and three six-episode DVDs have been released to date. The first six seasons of the series have been released in complete DVD box sets. United Kingdom-based Clear Vision has the publishing rights for the first two seasons throughout Region 2, including most of Western Europe and the Middle East; however, the company abruptly entered administration in December 2013, and has managed to only release three My Little Pony DVD volume sets as of April 2014 by August 2014. Another Region 2 distributor known as Primal Screen had since taken over the license from Clear Vision. Madman Entertainment has the license for publishing the series via DVDs and digital downloads in Region 4  but since Season 4, Beyond Home Entertainment took over the license. Friendship Is Magic is associated with the 2010 relaunch of My Little Pony toy line, having figurines and playsets based on it. A section of the Hasbro website gives information about Friendship Is Magic for children and their parents, including character backgrounds, videos, and interactive games and media. Due in part to the older fans, Hasbro has come to see My Little Pony as a "lifestyle" brand, with over 200 licenses in 15 categories of products, including clothing, houseware, and digital media. The brand grossed over 650 million USD in retail sales in 2013, and one billion USD annually in retail sales in 2014 and 2015. In early 2019, Hasbro Studios released five tie-in animated shorts on their YouTube channel. My Little Pony: The Movie, a theatrical animated film adaptation of the television series, was released on October 6, 2017 in the United States, distributed by Lionsgate. The film is directed by series supervising director Jayson Thiessen and written by showrunner Meghan McCarthy, and is financed by Hasbro Studios' film subdivision, Allspark Pictures. The series has received positive reviews from critics. Todd VanDerWerff of The A.V. Club favorably noted its "sheer and utter joyfulness" and lack of cynicism, unlike many other shows that garnered a cult following of parents and adults. He complimented the characters' stylized appearance, the stories' relative complexity for children's television, and the solid jokes which make the show enjoyable for parents as well as children. He gave the series a B+. The show has been critically praised for its humor and moral outlook by Brian Truitt of USA Today. Genevieve Koski of The A.V. Club later commented that Friendship Is Magic is an example of a show that, while considered "girly", has been able to tap into the nerd culture to allow it to gain wider acceptance than other comparable forms. Emily Ashby of Common Sense Media, an organization focusing on the parenting aspect of children's media, gave the show a rating of four out of five stars, emphasizing its messages of friendship, tolerance and respect, but advised parents to be wary of the "influence the characters might have on their kids' desires, since it's rooted in a well-known product line of books, toys, and just about everything in between." Liz Ohanesian, for L.A. Weekly, said that the show is "absolutely genuine in its messages about friendship but never takes itself too seriously". Matt Morgan, writing for Wired's "GeekDad" column, praised the show for having "rebooted the long-time Hasbro property while managing to lace it with geeky undertones" and being one of the few "girl-focused shows that a geeky dad can appreciate with his daughter". Los Angeles Times critic Robert Lloyd called the show "smarter and sassier and more aesthetically sophisticated" than any of the previous My Little Pony cartoons, and praised its ability to appeal to both children and their parents, in that it is "smart and sprightly and well-staged, and never horribly cute". TV Guide listed Friendship Is Magic as one of the top sixty animated shows of all time in a September 2013 list. Other praise for the show included its style, stories, characterisation and discussion of feminism. Kathleen Richter of Ms. believed that Friendship Is Magic did little to change the nature of older animations for girls, which she considered "so sexist and racist and heteronormative." For example, she suggested that, through the character of Rainbow Dash, the show was promoting the stereotype that "all feminists are angry, tomboyish lesbians." She also considered that the only darker-colored ponies shown to date were in positions of servitude towards the "white pony overlord." Lauren Faust responded to these claims by stating that while Rainbow Dash was a tomboy, "nowhere in the show is her sexual orientation ever referenced" and "assuming [tomboys] are lesbians is extremely unfair to both straight and lesbian tomboys", and further stating that "Color has never, ever been depicted as a race indicator for the ponies." Amid Amidi, writing for the animation website Cartoon Brew, was more critical of the concept of the show, calling it a sign of "the end of the creator-driven era in TV animation". Amidi's essay expressed concern that assigning a talent like Faust to a toy-centric show was part of a trend towards a focus on profitable genres of animation, such as toy tie-ins, to deal with a fragmented viewing audience, and overall "an admission of defeat for the entire movement, a white flag-waving moment for the TV animation industry." Friendship Is Magic originally premiered with an average viewership of 1.4 million per month, but expanded to 4 million per month by the end of the first season, making it the highest-rated of any Hasbro offering at the time. Advertising Age reports that the viewership doubled between the first and the second season. The Hub Network reported that "Hearts and Hooves Day", an episode on the theme of Valentine's Day, which aired on February 11, 2012, in the middle of the second season, was the show's most-viewed episode ever, and the second highest of any program of the Hub network; its viewership exceeded 150% of that of the previous year. This was surpassed by the two-part season two finale, "A Canterlot Wedding", airing in April 2012, marking the broadcast as the highest viewership for the Hub Network to that date. Friendship Is Magic was nominated for three British Columbia Leo Awards for Animation, "Best Program", "Best Direction", and "Best Overall Sound". Additionally, the songs "Becoming Popular (The Pony Everypony Should Know)" (from season 2 episode 9, "Sweet and Elite") and "Find A Pet Song" (from season 2 episode 7, "May the Best Pet Win! "), both written by Daniel Ingram, were nominated, but did not win, for "Outstanding Original Song—Children's and Animation" at the 39th Daytime Emmy Awards. The show was named the best animated show for the 2011–12 television season in a user poll on the website Television Without Pity. Marcel Duperreault, Todd Araki, Jason Fredrickson, and Adam McGhie received a 2014 Leo Award for their work on "Power Ponies" for "Best Overall Sound in an Animation Program or Series" on June 1, 2014. Despite Hasbro's target demographic of young girls and their parents, My Little Pony: Friendship Is Magic has become a cultural and Internet phenomenon, with many male fans between 13 and 35. The response from the Internet has been traced to cartoon and animation fans on the Internet board 4chan, responding to Amidi's negative essay regarding the show and current trends in animation. As a result of the discussion on 4chan, interest in the show spread throughout other parts of the Internet, creating a large fanbase and a multitude of creative works, fan sites, and conventions. The fanbase has adopted the name "brony" (a portmanteau of "bro" and "pony") to describe themselves. The older fanbase had come as a surprise to Hasbro and staff members involved with the show. They have appreciated and embraced the fandom, adding nods to the fans within the show and the toys, while, early on, allowing the creative elements of the fandom to flourish without legal interference. The fandom was a meme upon the show's release, but it’s popularity across the internet gradually faded, despite the show's continuation. Director Adam McKay was inspired by the visuals of Friendship Is Magic, which his daughters had watched frequently, in creating a short for Morgan Spurlock's 2014 educational/documentary web series, "We the Economy", using cartoon alpacas in the same style as the show to explain about income inequality. In early 2016, Hasbro was sued by Font Brothers over Hasbro's use of the font "Generation B" for much of its product packaging and marketing with the Friendship Is Magic show and toyline, including the "Friendship Is Magic" text in the show's logo. Font Brothers claim that Hasbro has been using this font in an unlicensed manner and is seeking up to $150,000 for each violation of its use. Dialogue from a My Little Pony: Friendship Is Magic episode was brought up during the 2016 Republican National Convention by then-RNC chief strategist (and future White House Press Secretary) Sean Spicer to defend Melania Trump against accusations of plagiarism. ^ Daniel Ingram was the main composer for the episodes "Magical Mystery Cure" in season 3, "Pinkie Pride" in Season 4, "Crusaders of the Lost Mark" in Season 5, and "A Hearth's Warming Tail" in Season 6. ^ Caleb Chan was the main composer for the episode "A Hearth's Warming Tail" in Season 6 and provided additional music for the episode "Crusaders of the Lost Mark" in Season 5. 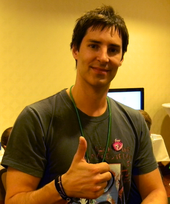 ^ Steffan Andrews was the main composer for the episodes, "Magical Mystery Cure" in Season 3 and "Pinkie Pride" in Season 4. ^ Won via People's Choice as chosen by the BTVA community. ^ Also known as Studio B Productions in season 1 and season 2's "The Return of Harmony". ^ "My Little Pony: The Movie. Closing credits". Retrieved October 3, 2017. ^ Tyrrel, Rebecca (December 24, 2004). "Pony tale". The Telegraph. Retrieved November 4, 2011. ^ Hix, Lisa (June 28, 2012). "My Little Pony Smackdown: Girls vs. Bronies". Collectors Weekly. Retrieved June 28, 2012. ^ Hayes, Summer (May 1, 2008). The My Little Pony G1 Collector's Inventory. Priced Nostalgia Press. ISBN 978-0-9786063-1-2. ^ Erickson, Hal (June 30, 2005). Television Cartoon Shows: An Illustrated Encyclopedia, 1949–2003, The Shows M-Z. 2. McFarland & Company. pp. 575–576. ISBN 0-7864-2256-4. ^ Hayes, Summer (June 15, 2007). The My Little Pony G3 Collector's Inventory. Priced Nostalgia Press. ISBN 978-0-9786063-5-0. ^ a b c d e f g h i j k "Tekaramity" (September 15, 2011). "Exclusive Season 1 Retrospective Interview with Lauren Faust". Equestria Daily. Retrieved September 16, 2011. ^ Anderson, Monika (August 12, 2011). "Never Too Old For "ThunderCats"?". The Wall Street Journal. Retrieved August 12, 2011. ^ a b Griffiths, Daniel Nye (September 27, 2011). "Friendship is Massive – Ponies, Internet phenomena and crossover audiences". Daniel Nye Griffiths. Retrieved January 19, 2012. ^ a b c d e f Strike, Joe (July 5, 2011). "Of Ponies and Bronies". Animation World Network. Retrieved July 6, 2011. ^ a b c d e f Faust, Lauren (December 24, 2010). "My Little NON-Homophobic, NON-Racist, NON-Smart-Shaming Pony: A Rebuttal". Ms. Retrieved July 6, 2011. ^ Ohanesian, Liz (May 21, 2012). "Lauren Faust on Her Favorite Childhood Toy and Pitching Animated Shows for Girls". LA Weekly. Retrieved May 21, 2012. ^ Lauren Faust (September 10, 2014). Inside Sony Pictures Animation - Director Lauren Faust. Sony Pictures Animation. 7:25 minutes in. Retrieved September 10, 2014. ^ Wilson, Melody (July 3, 2012). "Why do These Grown Men Love "My Little Pony?"". Slate. Retrieved July 3, 2012. ^ Faust, Lauren (December 5, 2010). "MLP News- TOY FAIR PICS!!!". deviantArt. Retrieved October 7, 2011. ^ Davis, Lauren (December 2, 2013). "Lauren Faust shares her childhood My Little Pony collection on Twitter". io9. Retrieved December 2, 2013. ^ Plank, Willa; Pereira, Joseph (December 22, 2009). "Hasbro Chief Spins Toys to Hollywood Tales". The Wall Street Journal. Retrieved October 7, 2011. ^ "DHX Media Rebrands Across Divisions" (Press release). DHX Media. September 8, 2010. Archived from the original on February 2, 2014. Retrieved March 3, 2012. ^ a b 'Tekaramity' (September 13, 2011). "Exclusive Season 2 audio interview with Jayson Thiessen". Equestria Daily. Retrieved September 16, 2011. ^ Sims, Chris (July 15, 2012). ""We Love The Bronies": The Cast And Writer Of "My Little Pony" On MLP And Its Fans [SDCC]". Comics Alliance. Archived from the original on July 18, 2012. Retrieved July 18, 2012. ^ "The Year That Was – 2010". Top Draw Animation. Archived from the original on October 31, 2014. Retrieved February 9, 2012. ^ "The Year That Was – 2011". Top Draw Animation. Archived from the original on October 31, 2014. Retrieved February 9, 2012. ^ "Voicebox Productions". Voicebox Productions. Archived from the original on November 2, 2011. Retrieved August 2, 2011. ^ Keeble, Ellen (May 21, 2012). "Voicing pony magic". Calgary Sun. Archived from the original on October 21, 2012. Retrieved May 21, 2012. ^ "Tekaramity" (June 29, 2011). "Interview: Will Anderson (Friendship Is Magic score composer)". Equestria Daily. Retrieved August 2, 2011. ^ a b c d e Rutherford, Kevin (April 20, 2012). "Behind the Music of Pop Culture Smash "My Little Pony: Friendship Is Magic"". Rolling Stone. Retrieved April 20, 2012. ^ a b c Connelly, Sherilyn (November 9, 2012). "Interview: Daniel Ingram, Songwriter for My Little Pony: Friendship Is Magic". SF Weekly. Retrieved November 9, 2012. ^ a b Burlingame, Russ (March 1, 2013). "My Little Pony's Emmy-Winning Daniel Ingram on Scoring for Kids of All Ages". Comicbook.com. Retrieved March 1, 2013. ^ Barnett, Annie (July 14, 2012). ""My Little Pony: Friendship is Magic" Comic-Con panel: Twilightlicious!". Entertainment Weekly. Retrieved July 16, 2012. ^ Weinman, Jaime (September 7, 2011). "Ponies Do Sondheim". Maclean's. Retrieved September 8, 2011. ^ Schenkel, Katie (January 28, 2012). "Harold Hill comes to My Little Pony". Retrieved January 31, 2012. ^ Miller, Lisa (November 6, 2014). "How My Little Pony Became a Cult for Grown Men and Preteen Girls Alike". New York Magazine. Retrieved November 6, 2014. ^ Ostroff, Joshua (October 22, 2013). "People are kids, too". The Grid. Archived from the original on October 22, 2013. Retrieved October 24, 2013. ^ "Meet The Ponies – My Little Pony". Hasbro. Retrieved March 18, 2011. ^ a b c VanDerWerff, Todd (April 29, 2011). "My Little Pony Friendship Is Magic". The A.V. Club. Retrieved April 30, 2011. ^ Busis, Hiliary (January 29, 2013). "'My Little Pony: Friendship Is Magic' exclusive: Twilight's becoming a princess!". Entertainment Weekly. Retrieved January 29, 2013. ^ Crouse, Megan (September 16, 2014). "My Little Pony: Friendship is Magic and "Serious" Fantasy". Den of Geek. Retrieved September 16, 2014. ^ Libman, Andrea (November 22, 2011). "Untitled". Andrea Libman's official Twitter. Retrieved November 26, 2011. ^ Anders, Charlie Jane (September 12, 2011). "Watch Star Trek's John de Lancie playing a godlike entity on My Little Pony". io9. Retrieved September 27, 2011. ^ 'Cereal Velocity' (September 25, 2011). "Massive Jayson Thiessen Q&A From Bronycon". Equestria Daily. Retrieved September 27, 2011. ^ a b Stelter, Brian (October 10, 2010). "A Children's Channel Retools". The New York Times. Retrieved October 10, 2010. ^ Andreeva, Nellie (March 24, 2011). "The Hub Orders 9 New Series, Renews 10 Shows, Acquires "5th Grader"". Deadline Hollywood. Retrieved July 18, 2011. ^ "The Hub Television Network Unveils Robust 2011–12 Program Schedule, Building on Success as Destination for Kids and Their Families" (Press release). Discovery Communications. March 24, 2011. Retrieved August 22, 2011. ^ Watercutter, Angela (September 12, 2011). "Exclusive Clip: My Little Pony Back for Season Two". Wired. Retrieved September 12, 2011. ^ "Saturday, September 17, 2011 Broadcast & Cable Final Ratings". The Voice of TV. September 21, 2011. Archived from the original on September 30, 2011. ^ Kern, Mark J. "Hub TV Network Scores Record High Audience With Outstanding Performance of Special Royal Wedding of the Year on "My Little Pony Friendship is Magic"" (Press release). Hasbro. Archived from the original on April 28, 2012. Retrieved April 25, 2012. ^ "My Little Pony: Friendship is Magic". hasbrostudios.com. Archived from the original on February 14, 2015. Retrieved February 19, 2015. ^ "My Little Pony: Meet Rainbow Dash". Archived from the original on September 26, 2013. Retrieved September 17, 2013. ^ Getzler, Wendy Goldman (September 7, 2011). "Hasbro Studios series head to Asia". Kidscreen. Retrieved September 21, 2011. ^ "My Little Pony: Friendship is Magic Television New Zealand Entertainment TV One, TV2". Retrieved August 12, 2015. ^ "Official e-junior Facebook announces My Little Pony for May 2014". May 4, 2014. Retrieved August 4, 2014. ^ "Hasbro Studios, Turner Broadcasting Seal Deal for 'Transformers Prime,' 'Chuck and Friends,' 'My Little Pony' and 'Pound Puppies'" (Press release). Hasbro. December 13, 2010. Archived from the original on September 3, 2017. Retrieved July 9, 2011. ^ McDonald, Andrew. "Brand building". c21media.net. Retrieved July 9, 2014. ^ "MY LITTLE PONY FRIENDSHIP IS MAGIC, Season 1 (HD)". Hasbro. Retrieved October 11, 2011. ^ "Hasbro Studios Signs Multi-Year Deal with Netflix to Provide Its Award-Winning Content across Multiple Platforms in the U.S." (Press release). Hasbro. April 5, 2012. Archived from the original on April 13, 2012. Retrieved April 5, 2012. ^ a b Z (February 9, 2012). "Everypony Come Aboard The Friendship Express". Wired. Retrieved February 9, 2012. ^ a b Lambert, David (September 7, 2012). "My Little Pony: Friendship Is Magic – 'Adventures In The Crystal Empire' and 'Season 1' DVDs". TV Shows on DVD. Archived from the original on September 9, 2012. Retrieved September 7, 2012. ^ a b Lambert, David (March 27, 2013). "My Little Pony: Friendship Is Magic - Shout!Press Release Announces "Season 2" DVDs". TV Shows on DVD. Archived from the original on March 30, 2013. Retrieved March 27, 2013. ^ a b "My Little Pony Friendship Is Magic: Season Six". Shout! Factory. August 2, 2017. Retrieved August 2, 2017. ^ Sacco, Dominic (April 18, 2013). "Hasbro inks home entertainment deal with Clear Vision". Licensing.biz. Archived from the original on May 4, 2013. Retrieved April 18, 2013. ^ Tilton, Robert (March 19, 2014). "TNA's UK DVD Partner Files For Bankruptcy" (Press release). Wrestling Inc. Retrieved April 25, 2014. ^ "Madman Entertainment Secures New Distribution Deal with Hasbro Studios" (Press release). Madman Entertainment. April 2, 2012. Retrieved February 14, 2013. ^ Lambert, David (November 7, 2011). "My Little Pony: Friendship Is Magic – The Hub Network's New Series Comes to DVD from Shout!Factory". TV Shows on DVD. Archived from the original on November 10, 2011. Retrieved November 7, 2011. ^ "PR: "My Little Pony – Friendship is Magic: Royal Pony Wedding" Available August 7, 2012, from Shout!Factory" (Press release). Shout! Factory. May 7, 2012. Retrieved May 7, 2012. ^ "Shout!Factory". Shout!Factory. Retrieved October 6, 2014. ^ Lambert, David (September 7, 2012). "My Little Pony: Friendship Is Magic - "Adventures In The Crystal Empire" and "Season 1" DVDs". TV Shows on DVD. Archived from the original on February 23, 2013. Retrieved February 15, 2013. ^ Liu, Ed (January 28, 2013). "New Clips Released from "My Little Pony: Friendship is Magic – Pinkie Pie Party" DVD". Toon Zone. Retrieved February 15, 2013. ^ "My Little Pony: Friendship Is Magic - Princess Twilight Sparkle" (Press release). Shout! Factory. March 8, 2013. Archived from the original on March 17, 2013. Retrieved March 8, 2013. ^ "My Little Pony Friendship Is Magic: A Pony For Every Season". Amazon.com. June 2, 2014. Retrieved July 19, 2014. ^ "My Little Pony Friendship Is Magic: Season 3". Amazon.com. November 8, 2014. Retrieved July 19, 2014. ^ "My Little Pony Friendship Is Magic: A Dash of Awesome". Amazon.com. December 5, 2013. Retrieved July 19, 2014. ^ "My Little Pony: Friendship Is Magic - Shout! 's Press Release Announces "The Keys Of Friendship"". TV Shows on DVD. April 17, 2014. Archived from the original on April 19, 2014. Retrieved April 17, 2014. ^ "My Little Pony Friendship Is Magic: Spooktacular Pony Tales". Amazon.com. June 2, 2014. Retrieved July 19, 2014. ^ "My Little Pony Friendship Is Magic: Season Four". Amazon.com. September 4, 2014. Retrieved September 4, 2014. ^ "My Little Pony Friendship Is Magic: Adventures Of The Cutie Mark Crusaders". Shout!Factory. November 5, 2014. Retrieved November 5, 2014. ^ "My Little Pony Friendship Is Magic: Cutie Mark Quests". Shout! Factory. March 2, 2015. Retrieved March 2, 2015. ^ "My Little Pony Friendship Is Magic: Games Ponies Play". Shout! Factory. June 9, 2015. Retrieved June 9, 2015. ^ "My Little Pony Friendship Is Magic: Friends Across Equestria". Amazon.com. March 1, 2016. Retrieved March 1, 2016. ^ "My Little Pony Friendship Is Magic: Friends and Family". Shout! Factory. March 11, 2016. Retrieved April 26, 2016. ^ "My Little Pony Friendship Is Magic: Season Five". Amazon.com. April 6, 2016. Retrieved April 6, 2016. ^ "My Little Pony Friendship Is Magic: Soarin' Over Equestria". Shout! Factory. May 4, 2016. Retrieved May 4, 2016. ^ "My Little Pony Friendship Is Magic: Everypony's Favorite Frights". Shout! Factory. May 10, 2016. Retrieved May 10, 2016. ^ "My Little Pony Friendship Is Magic: Exploring The Crystal Empire". Shout! Factory. November 4, 2016. Retrieved November 4, 2016. ^ "My Little Pony Friendship Is Magic: Twilight and Starlight". Shout! Factory. February 16, 2017. Retrieved February 16, 2017. ^ "My Little Pony Friendship Is Magic: Fluttershy". Shout! Factory. June 7, 2017. Retrieved June 7, 2017. ^ "My Little Pony Friendship Is Magic: Holiday Hearts". Shout! Factory. July 15, 2017. Retrieved July 15, 2017. ^ "My Little Pony Friendship Is Magic: Applejack". Shout! Factory. February 12, 2018. Retrieved February 12, 2018. ^ "My Little Pony Friendship Is Magic: Rarity". Shout! Factory. April 6, 2018. Retrieved April 6, 2018. ^ "My Little Pony Friendship Is Magic: Pony Trick or Treat". Shout! Factory. June 22, 2018. Retrieved June 22, 2018. ^ "My Little Pony Friendship Is Magic: Season Seven". Amazon.com. July 7, 2018. Retrieved July 7, 2018. ^ "My Little Pony Friendship Is Magic: Hearts and Hooves". Shout! Factory. October 13, 2018. Retrieved October 13, 2018. ^ a b c Vara, Vauhini; Zimmerman, Ann (November 4, 2011). "Hey, Bro, That's My Little Pony!Guys' Interest Mounts in Girly TV Show". The Wall Street Journal. Archived from the original on December 1, 2011. Retrieved November 4, 2011. ^ Truitt, Brian (November 26, 2012). "'My Little Pony' plants a hoof in pop culture". usatoday.com. Retrieved June 29, 2014. ^ Koski, Genevieve (July 5, 2011). "Why should grown women be ashamed of holding onto their adolescent passions?". The A.V. Club. Retrieved July 5, 2011. ^ Ashby, Emily (January 30, 2011). "My Little Pony Friendship Is Magic – Television Review". Common Sense Media. Retrieved May 9, 2011. ^ Ohanesian, Liz (May 7, 2012). "My Little Pony Project Brings Bronies and Pegasisters to Toy Art Gallery". L.A. Weekly. Retrieved May 7, 2012. ^ a b Morgan, Matt (September 17, 2011). "Could My Little Pony Be Raising the Next Generation of Geeks?". Wired. Retrieved September 17, 2011. ^ Lloyd, Robert (December 5, 2013). "TV Picks: "My Little Pony," Sondheim, Improv comics, "Doc Martin"". Los Angeles Times. Retrieved December 6, 2013. ^ Sands, Rich (September 24, 2013). "TV Guide Magazine's 60 Greatest Cartoons of All Time". TV Guide. Retrieved September 24, 2013. ^ "My Little Pony: A Transcultural Phenomenon". University of Brighton College of Arts and Humanities. Retrieved February 19, 2019. ^ Richter, Kathleen (December 9, 2010). "My Little Homophobic, Racist, Smart-Shaming Pony". Ms. Retrieved July 7, 2011. ^ House, Kelly (September 17, 2011). "Meet "bronies" – grown men who are fans of My Little Pony". The Oregonian. Retrieved September 17, 2011. ^ Pollack, Judann (November 28, 2011). ""My Little Pony: The Friendship Is Magic" Gains Unexpected Audience – Adults". Ad Age. Retrieved November 28, 2011. ^ "Stellar Performance of My Little Pony Friendship Is Magic Fan-Favorite Marathon Powers The Hub to Strong Audience Gains" (Press release). The Hub. February 14, 2012. Archived from the original on April 21, 2012. Retrieved February 16, 2012. ^ "Hub TV Network Scores Record High Audience With Outstanding Performance of Special Royal Wedding of the Year on "My Little Pony Friendship is Magic"" (Press release). Hasbro. April 24, 2012. Archived from the original on April 28, 2012. Retrieved April 24, 2012. ^ "Leo Awards – Nominees by Program". Leo Awards. Motion Picture Arts and Sciences Foundation of British Columbia. May 2, 2012. Retrieved May 2, 2012. ^ "39th Daytime Entertainment Emmy Awards Nominations". National Academy of Television Arts and Sciences. May 9, 2012. Archived from the original on June 28, 2013. Retrieved May 9, 2012. ^ Chaney, Jen (September 17, 2012). "'My Little Pony: Friendship is Magic' is the best animated show on TV, according to the Tubeys". Washington Post. Retrieved September 17, 2012. ^ "Leo Awards, Saturday Winners 2014". Leo Awards. Motion Picture Arts and Sciences Foundation of British Columbia. Retrieved June 1, 2014. ^ a b c d e f g h i j k l m n o p q r s t u v w x y z aa ab ac ad ae af ag ah ai aj ak al am an ao ap "My Little Pony: Friendship Is Magic Awards". IMDb. Retrieved October 29, 2015. ^ "BEST ANIMATED SERIES". TV.com. Retrieved October 29, 2015. ^ "BEST ANIMATED SERIES". TV.com. Retrieved October 30, 2015. ^ "2015 NOMINATIONS & WINNERS". The Joey Awards. Archived from the original on November 19, 2015. Retrieved November 16, 2015. ^ "THE NATIONAL ACADEMY OF TELEVISION ARTS & SCIENCES ANNOUNCES WINNERS FOR THE 43rd ANNUAL DAYTIME EMMY® AWARD NOMINATIONS" (PDF). PMC Deadline. May 1, 2016. Retrieved May 1, 2016. ^ "2016 Hugo Award Winner". Hugo Awards. Retrieved April 26, 2016. ^ "Winners by Evening" (PDF). Leo Awards. Retrieved June 5, 2016. ^ "2016 Winners by Evening" (PDF). Leo Awards. Retrieved May 30, 2016. ^ "2016 Winners by Name / Best Performance Animation Program or Series". Leo Awards. Retrieved July 26, 2016. ^ "2017 Leo Awards Winners by Name". Leo Awards. June 3, 2017. Retrieved June 3, 2017. ^ "2017 Leo Awards Winners by Name". Leo Awards. May 27, 2017. Retrieved May 27, 2017. ^ "BTVA 2017 Award Winners – Best Vocal Performance in a Television Series in a Supporting Role". Behind the Voice Actors. July 24, 2017. Retrieved July 25, 2017. ^ "BTVA 2017 Award Winners – Best Female Vocal Performance in a TV Special/Direct-to-DVD Title or Short". Behind the Voice Actors. July 24, 2017. Retrieved July 25, 2017. ^ a b c "UBCP/ACTRA Awards Announces 2017 Nominees". UBCP/ACTRA. September 18, 2017. Retrieved September 18, 2017. ^ "2018 Leo Awards - May 26 Winners & Nominees" (PDF). Leo Awards. May 26, 2018. Retrieved May 26, 2018. ^ "2018 Leo Awards - June 2 Winners & Nominees" (PDF). Leo Awards. June 2, 2018. Retrieved June 2, 2018. ^ Griffiths, Daniel Nye (January 19, 2012). "SOPA, Skyrim and My Little Pony – Infringement is Magic?". Forbes. Retrieved January 19, 2012. ^ Antonelli, William (August 28, 2018). "Friendship was magic: How Bronies are preparing for the end of My Little Pony". Polygon. Retrieved April 19, 2019. ^ Chai, Barbara (October 20, 2014). "Amy Poehler, Maya Rudolph Navigate Economy as Alpacas (Exclusive Clip)". The Wall Street Journal. Retrieved October 31, 2014. ^ "My Little Pony toymaker sued over alleged font misuse". BBC. January 26, 2016. Retrieved February 4, 2016. ^ Tatum, Sophie (July 19, 2016). "RNC official cites 'My Little Pony' to defend Melania Trump". CNN. Retrieved July 19, 2016. My Little Pony: Friendship Is Magic at Discovery Family. Archived from the original on October 20, 2014.